A fine display from Ballinlough saw them overcome a fancied Bective side in this Junior D quarter final played in Rathkenny on Thursday evening. The ‘Lough made hard work for themselves, with a very slow start to proceedings seeing Bective open up a 1-05 to 0-01 lead in the opening twenty minutes. Greg Hogge opened the scoring for Bective after a surging run from midfield, before lively wing back Paul Monaghan leveled matters for the Reds with a great finish from a tight angle. Bective then grabbed the initiative and scored 1-4 without reply, making the most of the breeze in their favour. The ‘Lough rallied before the end of the half, after being re-energised by a number of early changes. Ken Rothwell began this purple patch for the Red’s with an expertly taken point in the twentieth minute, shortly before full forward Simon Deevy tapped over a neat score. James O’ Higgins then opened his account for the day with a well struck free kick from close range. 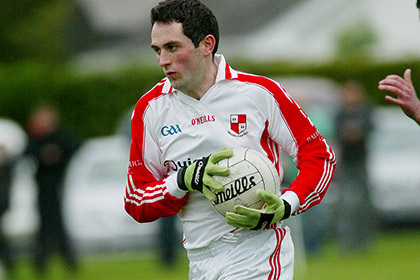 Super Sub Chris Gaughran, who picked up a couple of vital scores in last weeks draw to Moynalty, picked up his sides first major score of the game shortly before halftime. Deevy won the ball well in front of his man, and played a clever ball over the defence into an unmarked Gaughran, who made no mistake with a powerful finish into the back of the net. This left his side trailing by 1-07 to 1-04 at the change of ends. Ballinlough picked up in the second period where they had left off in the first, as momentum stayed firmly in their favour. They quickly levelled matters, thanks to further scores from Gaughran and O’Higgins. Deevy was often the focal point of their attack, doing well to win a lot of ball and quickly lay it on to those around him. The introduction of Johnathan Montgomery Francis also injected much needed pace into the Red’s attack, and the young forward was rewarded for his tireless effort with a well taken score early in the half. Bective struggled to regain the shape they had early on, and, despite the best efforts of Hogge who ran tirelessly in midfield, only managed two points in the second period. The ‘Lough went on to kill off the game in the closing stages with Rothwell and first team manager Tom Shine sending a couple of great efforts over the bar, before a brace from the impressive Kevin Mallen saw his side emerge with a five point victory. This was a great team performance by Ballinlough, and they showed quality throughout the ranks, including those introduced from the bench. Emmett Smith, James O’Keefe, Gary Reilly and Chris Gaughran were particularly impressive for the winners. A semi-final against Seneschalstown now awaits, with the Lough hoping they can end their 23 year wait for Championship success. Ballinlough: L. Gibney, J. O’ Keefe, E. Smith, M. Farrell, K. Beirne, J. O’Reilly, P. Monaghan, K. Mallen, G. Reilly, J. O’Higgins, K. Rothwell, A. Fox, P. Briody, S. Deevy, D. Farrelly. Subs: C. Gaughran for D. Farrelly, J. Montgomery Francis for A. Fox, T. Shine for P. Briody.